Camping is without a doubt an amazing way to spend your free time. This is a great opportunity to discover the beauty of your country, see different forests, fields, mountains, and beaches. For sure, this is a much cheaper way to have holidays without spending money on plane ticket and hotel. Still, you will need to spend some money on providing yourself a comfortable time. The main question is how to get electricity while camping? This is one of the most important things that you should take care of before going camping. As long as you are going to stay away from sockets for a few days, then, all your devices will need to be charged. If you are planning to read, play music, watch films, and make an emergency call if needed, then you need to have a special device that will give you electricity. We decided to list the most effective and convenient devices that will provide you with electricity while you are away from sockets. Take a look at top 5 portable rechargeable electric generator products and pick one that suits your expectations. One of the best things to provide power is to use a gas generator. An affordable and easily portable gas generators is PowerPro 56101 Gas Powered Portable Generator. This gasoline generator weights less than 36 pounds, therefore, you will be able to take it while camping and get power cheaply. It has got a handle, so you will easily carry it. When you fill the tank with one gallon, the generator will run for up to 5 hours. Unlike many gas generators that work very loud, therefore, are not powerful, this very model provides a quiet system and is certified for use in any national park or forest. If you do not want to buy oil or fuel and carry it to charge a gas generator, then you may think about solar power camping gear. On the marker, you can find solar panel generators of different sizes and capacity. One of the good findings is Suaoki 220Wh/20,000mAh Portable Generator Power Source. It is an affordable and easily portable solar generator that has got 200W Pure Sine Power Inverter), 2 DC outlets (an extra cigarette socket cable), 2 USB ports, 5 LED lights indicator. It can charge USB/5V, DC/12V and AC appliance anywhere. This very generator is powerful enough to charge smartphones 20+ times, tablet, USB port, laptops, TVs, mini-refrigerator or other household electronics. This is definitely a great choice to create your own camping power station and have electricity all day long. This is the best deal. The generator is durable, portable, and will make your outdoor holidays very comfortable. Another smart purchase is a tent with electrical port. If you need to but a new tent or you go camping for the first time and thinking what tent to buy, for sure it will be very useful to purchase a tent that has electric access. One of the best choices is Sundome 4 Person Tent. It comes for a good price, very roomy, comfortable for 4 people, made of polyester, has a large rear hooded window that provides airflow for cross ventilation. The tent has one 1 zippered electrical access port to run AC power into the tent, therefore, you will have electric and be able to charge your phone, watch laptop and read your ebook even when it is raining, cold, and windy. Such two-in-one purchase is definitely useful for camping and outdoor life. Also, you can review a tent camping with electric hook up that is waterproof and provides you electricity while you are having holidays in the middle of a field. You can choose the number of sockets that you need, and choose the length of the cable. There are different hook up cables that are customized to different requirements. If you do not have much space or do not want to carry generators, you can take a battery pack while camping. For example, Anker PowerCore 10000 is one of the smallest and affordable portable power sources. It provides 10000mAh external batteries, ultra-compact, therefore, will fit in the smallest backpack, offers a high-speed charging technology for iPhone, Samsung Galaxy and more devices. The portable charger comes with micro USB cable, travel pouch, welcome guide, and a worry-free 18-month warranty. This item will save you a lot of space. It requires only 2 hours to charge the device and then you can take it for your holidays round nature without losing connection with the world. This is a budget cell phone charger that can be used in everyday life as well. Just keep it in your bag and never have tour phone dead when you need it most. Another idea to keep your devices charged is to use a car battery. 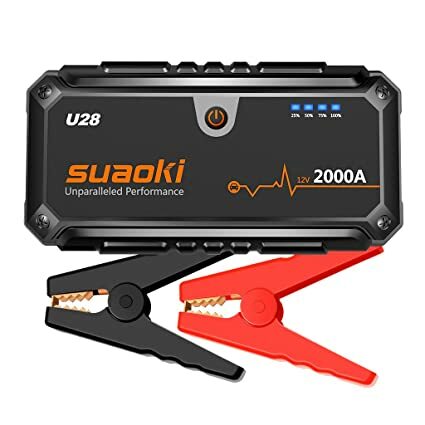 Suaoki U28 2000A Peak Jump Starter Pack 12V is a reliable and one of the best car batteries on the market. It guarantees a long lasting service, safe design and comes with a charge level indicator. The battery has a calcium tin-alloy technology for low electric resistance and advanced center lug technology. You can use this product for charging cell phones and one or two small appliances, however, you will have to be careful and not lower the battery too much, otherwise, your car will not start. No matter what source of power you choose for camping, you must be aware of safety rules. Make sure you know how to use a device and test it before you utilize it while camping. Remember, that it is dangerous to use power sourced inside a damp tent. Even when your tent is damp, make sure that you have a special, heavy-duty waterproof connector line that includes damp-proof sockets for plugging in your equipment. Choose the best portable charger for backpacking that suits your needs, Take into consideration how many hours of using electricity you will need, how many people will need to use a generator or a charger, think of the weather, and safety. As you can see, there are quite a few ways to get electricity while camping, so you should not resist enjoying nature because there are reliable and proven ways to charge your phone to make phone calls and tell everyone how much you enjoy your outdoor holidays, watch movies, read books, take pictures, etc. Once you choose the source of power, take care of charging it in advance!